Nobody wants to be financially broke. In fact, a lot of people are advised to look for tips to survive any looming financial crisis. This is a lesson learned by a lot of consumers not too long ago when the country weathered the most recent economic crisis. The market collapsed sent the economy crashing down catching American’s off guard with their finances. There is no way to know when the next financial crisis will hit or when a person’s finances will take an unexpected turn for the worse. There is no fortune teller in this world who can ever come close to giving you an accurate prediction of the future. What you can do is to find out the signs that will tell you that you are in danger of making a financial blunder. Some of you are probably going through tough financial situation already because of overwhelming debt. You have considered all your options to get rid of debt like debt consolidation or refinancing. But you just cannot afford any of it. While this can be a very difficult time, you need to know that it is not the end of the world. CBSNews.com recently shared that 70% of Americans go through multiple financial problems such as lack of savings, unmanageable debt and a low income. This prevents a lot of people to meet their financial obligations which eventually, leads to them being classified as financially broke. This is not an ideal financial situation to be in, that is true. However, you need to know that even the most negative and difficult situation can end up giving you something positive. Not everyone would dream of being in a situation where they do not have enough to meet their financial needs. But think about this for a moment. If you think that you are in the lowest point when it comes to your finances, there is no where else to go but up. That is right, when times are bleak and there seems to be no hope for your current situation, it really helps to stay positive. Believe it or not, every mistake comes with a lesson. Sure there will be suffering and a lot of sacrifices will be made. But being financially broke is not the end of the road for you. Looking at your situation in a different perspective will make you realize that they are certain benefits to being broke. We can name three of them. You will learn to live with less. Enough with the materialistic perspective that owning a lot makes you affluent. If you do not need it, then it does not make sense for you to possess it. Why waste money on something that you can live without just because your neighbor has it? Being financially broke will teach you how you can live with less. Material possessions are overrated and this is a lesson that can be quickly learned by people in deep financial trouble. Being a minimalist is one of the great takeaways from having too little. And this attitude can help you stay debt free. You will not be pressured to buy a lot because you know that you should only own what is necessary for you to survive. You will learn to value what cannot be bought. Another benefit that you will learn from being financially broke is the value of what cannot be bought. The truth is, we oftentimes forget what is really essential to make our lives happy. We do not need a lot of money. What we really need to make this life worthwhile is to have more quality in it. Spending more time with family always trumps spending money on them. Of course, this has to be taken in the right context. We need to finance the needs of our families but you should know when to stop so you can enjoy your earnings with them. This is something that you will realize when you become financially broke. You will derive happiness from the things that money cannot buy. The lack of cash will force you to. But once you get that habit, you will have a sense of liberation. You will no longer feel like you have to earn a lot in order to be happy and satisfied with your life. This is an important truth that you will learn. Apart from that, you will also learn to look for things that you can get for free. Being resourceful is something that you will hone when you are broke. Desperate times call for desperate measures right? You will learn to be creative so you can enjoy the things you used to love for free. You will learn the importance of being prepared. Finally, you will realize just how important it is to be prepared. Some people do not save for unexpected expenses because they fail to realize how it can prevent them from being financially broke. There are those who go broke because they have amassed too much debt. You need to remember that sometimes, a sufficient emergency fund can help you avoid debt – thus minimizing the chances of you being broke. The bottom line is, you need to start saving because that is one of the ways you can avoid a financial crisis. According to an article published on CNBC.com, one out of five retirees die broke. You know why? Because they did not save enough for retirement. In fact, it is revealed that one out of 10 even died with some sort of debt to their name. Do not let this happen to you. Once your finances start picking up, make sure you will start saving. That way, you can prevent another financial crisis from happening in your life. Look for these lessons while you are financially broke so you can come out of this situation a better person. It may be a difficult time in your life but that does not mean you should not come out fighting. More than surviving, you need to make sure that you can get something positive out of it. Surviving a financial catastrophe is no joke. It is also not an easy task. But most of the time, we do not have a choice but to go through it. Fortunately, there are tips that you can use to help you survive being financially broke – no matter how grave the situation is. Review your budget. Start by looking at your budget. If you do not have one, make one. But if you do have a budget plan, this is the best time for you to review it. If you are going through some tough financial times, that means there is something wrong with your budget. You need to improve that. Cut back on food spending. The truth is, you should never sacrifice the nutrition of your family. That being said, you can save a lot of money by cooking at home! According to an article published on AOL.com, Americans may be financially broke because they spend too much money eating out. 44% of the respondents said that the money they spend dining out and other entertainment expenses are affecting their bank accounts. Just cook your own meals from scratch and you may be better off both financial and health-wise. Sell unnecessary possessions. Another thing that will help you survive being financially broke is when you sell things that you own that you do not need. Not only will you clean up your life by getting rid of the clutter, you can benefit from the money that you will earn from it. Find another source of income. Lastly, you need to go look for another source of income. 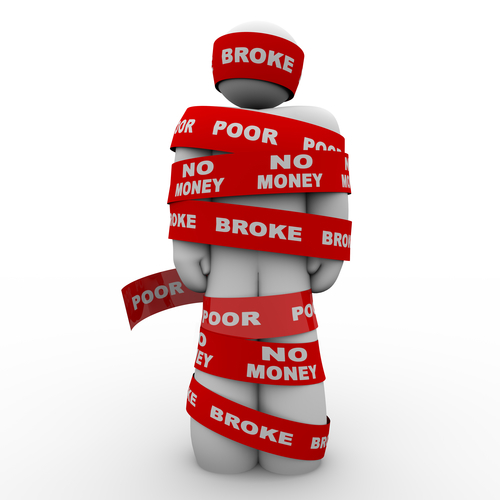 If you are financially broke, that means you need to earn more. Some people choose between earning more and spending less. Well you can do both. Here is a video that will give you real ideas about a second source of income.